His debut book, Navigating India is a non-preachy, non-prescriptive and unbiased account of the possibilities that define India amidst magnificent paradoxes. It provides an experiential compass through first-hand accounts and insights from some of India’s most respected names in business, public governance, diplomacy and intelligentsia. It lucidly explains the frequent and vital intersections between the government and business, culture and modernity, demographics and democracy—all of which are vital to understanding India. 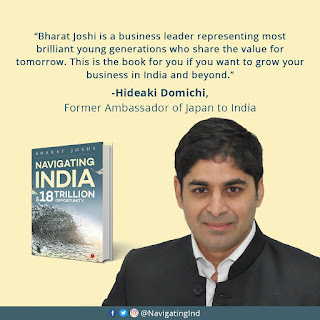 The book postulates the heights India might reach by harnessing technology and with a collaborative political, regulatory and business response to the rapidly evolving needs and aspirations of young, impatient Indians. 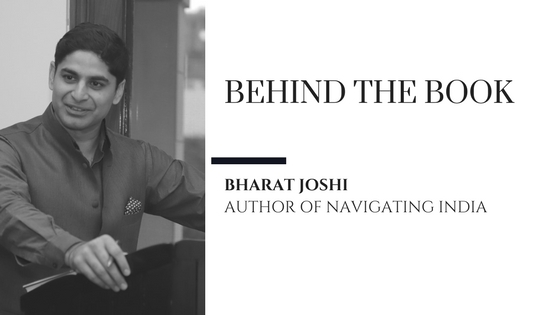 Bharat Joshi offers a candid, accessible and objective guide to a complex, albeit compelling, economy. Doodh ka jala, chachh bhi phoonk phoonk ke peeta hai, (a Hindi saying which means ‘once bitten twice shy’, or literally, ‘those scalded by milk, drink buttermilk cautiously too!’)—the moral of this story is not to put you off old economy business (or dairy) in India, but to understand that there are second chances. Dhruv Shringi of Yatra and its famous portal yatra.com (‘yatra’ is Hindi for ‘journey’) swore off industrial ventures years ago, when he witnessed governmental apathy and corruption first-hand. So put off was he by his failed enterprise, that his second venture was planned around a sector with little or no governmental interface. Dhruv was still in college, when as a first-generation entrepreneur (his father was an army man) he invested most of his father’s life savings in a venture with an acquaintance of his father’s to set up a chemical factory near Delhi. After three excruciating years, the Shringis exited the business, Dhruv completed his education, and got a job in London. He returned a few years hence, and decided to risk it all once again with a foray in e-commerce. But here’s the story in slo-mo. In 1991, the year after the Mandal Commission,Dhruv entered college, and ‘since not much was happening in college’, decided to take the entrepreneurial plunge at eighteen. The aforementioned chemical factory was set up in Bhiwadi. His father, whose savings financed Dhruv’s share of the equity, was as naïve as him in matters of commerce (having retired from the army). The business partner had an existing business of the same nature, so gave the Shringis comfort on the execution front. After a long process of obtaining approvals and licenses, the venture commenced production. However, governmental interface proved to be a daunting challenge on an ongoing basis with various local bodies including the Rajasthan State Industrial Development Corporation (RSIDC; Bhiwadi is in Rajasthan), Departments of Excise, and Sales Tax, the Rajasthan State Pollution Control Board (RSPCB), and of course, labour-related challenges. Dhruv realized that unless you knew how to manage the system at the grassroots level, you couldn’t scale-up the business. It was a challenge to get an Excise Officer to visit his factory when goods needed to be shipped, says Dhruv. He would hold on to the inventory for days waiting for the Inspector, because the Inspector felt he hadn’t ‘been adequately rewarded’ the first time round. In addition, Dhruv’s partner felt the Shringis were being ‘disruptive’ by being upright, and adding cost to the business by not paying bribes as per the prevailing norm. Anyhow, after three long years at the school of hard knocks, the Shringis decided to exit a loss-making business. Dhruv’s father lost a fair amount of money (substantially his commuted pension and savings), in the venture which ended in an acrimonious parting of ways. Dhruv, who had become quite a cynic by this time, was left to learn that legally enforcing a contract was hard and required an inordinate amount of time and effort, especially for a small, unlisted company. A useful jab in the ribs came from a well-wisher in the police, who bluntly advised the Shringis, ‘Economic offenses are not a priority for the police.’ The prospect of waiting twenty or thirty years before getting redress is discouraging to even the most litigious businessmen, which the Shringis were not.